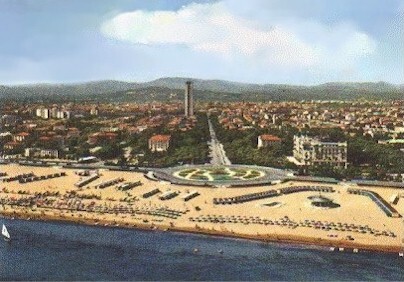 Rimini. A bit about my city. 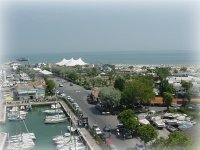 Rimini was founded by the Romans as a colony of Latin Law in 268 B.C. on a preexistent site built between the Ausa and the Marecchia rivers as a little port - centre and road junction. It rose to Municipium and was enrolled in the Aniense tribe in 90 B.C. In 359 A.D. it was the seat of a council summoned by the Emperor Costanzo II. In the 6th century it took part in the marine Byzantine five-towns alliance before falling into the hands of Longobards. From the 8th century it belonged to Church territory. In 1157 its municipal autonomy was recognised by Frederick Barbarossa and by the pope. It was Malatesta's dominion from the late 1200's to the 16th century, then it belonged to Cesare Borgia and then to the Venetians. In 1509 the ecclesiastical jurisdiction returned to power until 1860 when it ended by public vote. This ratified the annexation of the town and of its territory to the Kingdom of Italy. Rimini has a surface of 134 sqkm where are leaving 130.000 inhabitants. It is the capitol city of the newborn province of Italy placed in the most southern part of the Po Valley in the sunny Romagna region. Located on the Adriatic sea it has one of the longest and beautiful beach to welcome alone over 1.000.000 of peoples during their summer vacations. Not only in bathing.. but also in artistic and cultural relaxing. 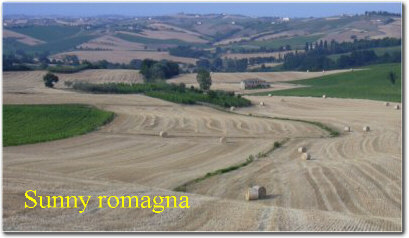 In fact Rimini inland is rich of hills with Palaeolithic , Iron, Copper and Bronze Ages sites............ Antique churches and lot of castels ...Memories of signories....... famous architects..sculptors.. Guidi'....... Malatesta' ..... Francesca da Rimini........ Cagliostro...... fascinating menstories ... legends...... radioamateurs. In Rimini and its inland are leaving about 100 radioamateurs . Usually they spend their free time in radio design, trying new comunication modes and in the DXing. This last gives big opportunity to all of them to improve their culture in languages, geografical knowledges, human relations and friendships. Often the local radioamateurs give their hight professionality to the local civil defence, as voluntary service, in repeaters and radio stations building and radio operating activity. Some of their are in the DX world wide Honor Roll and members of contest teams world winners , and recordmen in annual international contests. The radioamateur that visits Rimini during summer holiday and wishing to try for an "eyes-balls QSO" with a local old-man known "by air" the R0 repeater, located in the Rimini hills, can help him ( if licenced) in spreading his search. The FM R0 frequency is 144.500-In, 144.600-Out Mhz . Close to Rimini there is the small and ancient San Marino Republic that all radioamateurs now know by the T7 prefix in the calls..It is easy to rise the Titano mountain trought a fast dual carriage-way dipped in a nice and sunny country. When San Marino begin in amateur radio had M1 prefix in the call. It was a very rare DX country QSO. In fact only two radio amateurs were active from there . Their calls were M1A and M1B (now silent-keys) and all the world tryed badly to found their signals. Today many hams from the Titano' republic send their signals on the air; and the QSO is easy every bands and mode. At present regular activity (WARC enclosed) is made by T77C Tony ( mostly cw ) and T77M Lino ( mostly rtty ). Let e-mail me if you have difficult to work this DXCC country. I will be happy to try to organize a schedule for you. To improve this page other infos and pictures " freewere" will be wellcome to this e-mail address.